Over the past month, some PBS stations acknowledged that there might be more than one group of Celtic women who are making beautiful music that grew out of the heartland of Irish America, so they opened up their airwaves to a production that was filmed at Bushnell University last year. The show was produced by Cherish the Ladies, who are now in their 29th year as a performing troupe, under the title of An Irish Homecoming which, unfortunately, did not land a metro New York PBS outlet this year during their predictable pledge drives aimed at coaxing cash out of the Celts under the pressure of their “pay to see” concept of programming. While the Cherish the Ladies show may yet land a future airing locally, the multi-talented group and, in particular, its indefatigable leader and founder Joanie Madden received a real Irish homecoming where the Bronx meets Yonkers last weekend at events supporting the McLean Avenue St. Patrick’s Day parade. In selecting as their grand marshal the popular Irish American musician Madden, the McLean Avenue Merchants Association couldn’t have chosen a more appropriate person for the honor. 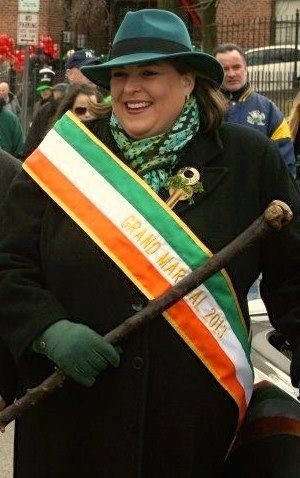 Madden spent her grammar school years in Woodlawn, the Irish enclave in the Bronx where even today 53 percent of the residents claim some Irish blood according to the New York Daily News and the last census. It was there her music lessons on whistle and flute began under the tutelage of Jack Coen, a fellow Galwegian and musician who often played with Joanie’s seminal influence, her father Joe, an accordion player from Portumna in East Galway. The music stuck with her and many other young Irish American women who gave rise to the Cherish the Ladies phenomenon that was launched by Dr. Mick Moloney and the Ethnic Folks Arts Center back in the 1980s. For a number of years Madden has owned her own home north of McLean Avenue, where she is a well-recognized and regular supporter of the neighborhood merchants and a loyal resident of Yonkers, which has also made her fellow members of Cherish the Ladies welcome during their tour respites. So it was no surprise that Rory Dolan’s was packed to the gills last Thursday night as the ceremonial grand marshal sash was attached to Madden, kicking off the weekend. As a member of the Irish community along McLean Avenue, Madden is well aware of the valuable work performed by the Aisling Irish Community Center (www.aislingcenter.org) for all generations of Irish people. Madden worked with them to create Cherish the Ladies’ first-ever concert in St. Barnabas Parish on Friday night, serving as a benefit for Aisling’s activities. A crowd of 500 or so turned up at St. Barnabas High School just a stone’s throw from where the parade would begin on Saturday. I have seen Cherish the Ladies perform in countless shows around this country and in Ireland, and I’m not sure I have ever experienced a better night’s entertainment or atmosphere from them and their special guests. The simple, unadorned high school auditorium which serves as a chapel for the students and also a larger church for the parish wasn’t the most glamorous backdrop or stage, but it was the genuine connection between the hometown crowd and the performers that was glowing all night. Madden was feeling the love from the audience, and feeling very much at home as the woman of the house, orchestrating her own band and special guests like Cathie Ryan, Tommy Flynn (an aide to the Grand Marshall also), Mickey Coleman and Erin Loughran and another local dance school, the Flynn Academy of Irish Dance. For singer Ryan, it was a homecoming in a couple of ways as the Detroit native lived in Woodlawn for a number of years, eight of them as the lead singer with the fledgling Cherish the Ladies. After a 17-year solo career she returned to perform on their March tour. Ryan’s crystal clear vocals, backed by the talented Cherish the Ladies musical ensemble of co-founder Mary Coogan (guitar), Grainne Murphy (fiddle), Mirella Murray (piano accordion) and Kathleen Boyle (keyboards and backup vocals) made this a homecoming to cherish. On tour with the group were a trio of outstanding dancers who have performed around the world with them in Michael Boyle (Boston), Declan McHale (Coventry) and Megan Lucey (Fairfield, Connecticut), whose fancy footwork was impressive and also gave ample evidence of what a truly complimentary dance musician Joanie Madden is. She led her group into a graceful set of “O’Carolan’s Planxties” that transitioned into a slip jig that gave flight to charming dance by Riverdance veteran Lucey, and later a powerful set dance by McHale called “The Hunt” that was punctuated note by step by Madden on her silver flute. Comical quips were flying all night from Madden’s mouth, mostly at her mother Helen’s expense as she mimicked her Clare accent and many motherly traits. But Joanie could melt all that humor away with the playing of the air “Longing for Home” that she composed after hearing her mom talk of a long-time absence from her native Miltown Malbay in the days when a Christmas letter brought so much news and fond memories, but reinforced the heartbreak of immigration. While it was hardly a liturgically sanctioned song for the church these days, the lifting of voices together in a common cause certainly was heavenly, as was the Friday night concert by Madden and Cherish the Ladies and Friends. The festivities were capped off by the Saturday parade up McLean Avenue on a dry, mostly sunny day where it would have been a little more comfortable if the wind was at your back. The crowd along the avenue was estimated to be about 20,000 who turned out to acknowledge the Queen of McLean Avenue (for the day) and then to celebrate along the Emerald Mile. Ireland’s Consul General Noel Kilkenny, in his introduction at the Friday night concert, praised the sense of community that sprung from the McLean Avenue neighborhood after Hurricane Sandy, and how the Irish stick together in times of need. That was certainly true, but the bonds that the Irish build up over weekends like this along McLean Avenue give sustenance to that spirit all year long.